On if he was aware that some people are calling for his arrest, Abdullahi said: “Am I too important not to be arrested if I have committed an offence? If I have committed a crime; of course, why not? It is also an opinion; some people may wish me dead. Is that not so? There might be some people who want me arrested. I thought that all countries have legal systems that qualify offences and depending on the gravity of the offence, measures are taken against offenders and so on. Prof. Ango Abdullahi says he will support Biafra after backing quit notice issued to Igbos. Prof. Ango Abdullahi says his statement backing the quit notice issued in the north shouldn't spark any controversy because Nigeria has been a polarised state for a long time - Abdullahi says no one has told him he committed a crime as there is freedom of speech in the country. However, the northern elder says he will support the Igbos in their dream of building a Biafra state Prof. Ango Abdullahi, former vice-chancellor of the Ahmadu Bello University, Zaria, Kaduna state, has reacted again after he sparked controversy following his approval of a statement by Arewa youths, asking Igbo to leave the North on or before October 1, 2017. According to Abdullahi, who is the spokesperson for the Northern Elders Forum, his backing of the quit notice issued to Igbos in the North, has changed nothing, because Nigeria has been a polarised state for a long time. Speaking in an inconclusive interview with The Punch and responding to a question if he was aware that his statement had sparked controversy, with Nigerians describing it as having the tendency to polarise the country and cause violence, Abdullahi said: “Well, I’m not a fan of newspapers or radio but I will take it from you that it has sparked controversy. The country had already been polarised. It is already polarised. Well, maybe it added another dimension to the polarisation but the country had been polarised. As far as I am concerned, the country has been polarised for a long time. 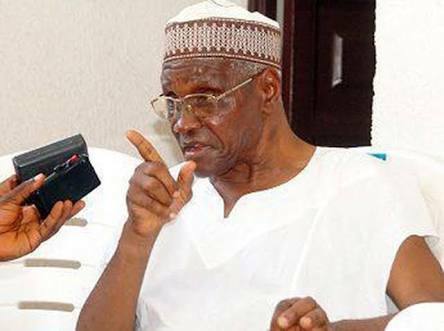 From 1966, the country has remained polarised.” Prof. Ango Abdullahi says he will support Biafra after backing quit notice issued to Igbos. Abdullahi said: “Am I too important not to be arrested if I have committed an offence? If I have committed a crime; of course, why not? It is also an opinion; some people may wish me dead. Is that not so? There might be some people who want me arrested. I thought that all countries have legal systems that qualify offences and depending on the gravity of the offence, measures are taken against offenders and so on. If I have committed an offence, I expect that somebody would have drawn my attention to it, but I don’t think anybody has drawn my attention to an offence that I have committed. All I have done is to express my freedom of speech and this is guaranteed in the country as far as I know.” However, Abdullahi noted that he will support the Igbos in their dream of building a Biafra state. He said: “The Igbo said they want to leave Nigeria. They have been saying this for a long time. They have wanted to leave Nigeria since 1967, when we had the civil war and they have not stopped asking to leave Nigeria. Abdullahi said that the order by the northern youths was in response to the unpalatable behaviour of their guests. He said the northern youths were venting their anger and frustration over what he described as the irresponsible behaviour of Igbo youths and elders.